Derek Stevens lights up at his favorite seat in The D—the Longbar. It's part of the casual atmosphere that Stevens invested $15 million to create, along with his brother Gregory. Six years ago, Fitzgeralds Hotel & Casino was your classic downtown Vegas dump, complete with old carpeting, lighting that cast a sickly hue and a cramped corner-bar unfit for sipping even the cheapest draft beer. Down the street, the Golden Gate was famous for being the oldest continually run casino in Vegas—and from the looks of the place, you wouldn't have needed any convincing. A couple of blocks away, the weirdly named Gold Spike was the kind of seedy dive you didn't want to walk past, much less walk into. If you were brave enough to venture a few blocks east of the El Cortez—which wears its retro cachet a lot better now than it did in the early 2000s—you encountered motels that pretty much served as crack dens and hoped you didn't get jumped. That was downtown Las Vegas. No more. Now that same walk will take you to a well-curated bookstore called The Writer's Block. Or the newly opened Chow restaurant where the Chinese southern fried chicken draws raves. Or a big barn of a shop called 11th Street Records, that specializes in vinyl and doubles as a live music venue, where Brandon Flowers—lead singer of the locally formed but nationally known band The Killers—turns up for surprise solo sets. "We're not getting J-Lo down here, but we don't want her," says Ryan Doherty, whose Commonwealth bar was one of the businesses that started downtown's resurgence. "When we first opened, there was a huge homeless contingent. It's gotten a lot cleaner and safer. I see people pushing strollers through the neighborhood. It's not something that I would have imagined six or seven years ago." These days, Fitzgeralds is no more. It has been rebranded and redone as The D, an initial that stands for both Derek and Detroit. In 2011 new owner Derek Stevens, in partnership with his brother Gregory, put $15 million into the place and made it a cool, casual spot for gambling and simply hanging out. It's also a place where you can eat well. Unlikely as it sounds, Andiamo Italian Steak House by Joe Vicari serves some of Vegas's best prime beef in a setting that is comfortably old school, with sequestering banquettes, solicitous waiters and a soundtrack of classical music. The aptly named Long Bar covers one side of the casino and it's where the jaunty, crewcutted Stevens likes to spend his nights. He bets sports, enjoys drinks and will chat you up about whatever games happen to be playing on the monitors that line a back wall. If he didn't own the joint, Stevens would probably nip off to the craps pit, with cash in hand and a smile on his face. Stevens is playing a major role in turning downtown Las Vegas into the kind of place where you want to spend time. Besides the D, the Stevens brothers also own the Golden Gate, another diamond in the rough that Derek has buffed to a shiny finish. Having made his first fortune in Detroit via the auto parts business, he bought into the Gate in 2008. Initially, the brothers had partnered in the operation with the previous owner, Mark Brandenburg, whose grandfather had been one of 22 Italian Americans to have founded the place. "There's a photo in the lobby that is a partners' picture from the 1970s," Stevens tells me. "It could be an opening shot for the sequel to Goodfellas. It's a great, great photograph." Gangsterish nostalgia aside, there wasn't a whole lot else good about the operation when Stevens came along with a vital infusion of cash. "The casino closed at 10 p.m., which is when I'm used to things ramping up," says Stevens who, along with his brother, would go on to buy out Brandenburg in 2015 and own the entire place. "Table games had a limit of $200 and the chips were so old that you could barely tell the red from the green from the black. We replaced those, we started raising the limits and kept the casino open around the clock." He also livened up the music and installed so-called party pits, where female dealers bare their midriffs and keep the gaming upbeat. When Stevens first got involved, the Gate had no hosts for drawing players, so he took matters into his own hands. A regular customer at Bellagio and Paris casinos, Stevens buddied up with Strip limo drivers and incentivized them to bring him business. "I gave drivers my card and told them that anytime they dump somebody at my place I would give them a 20," he remembers, reveling in the home-brewed nature of it all. "They'd call to tell me a customer was coming, I'd wait at the door, hand the driver a 20 and shake the customer's hand. Then I'd bring him inside and buy him a drink. We'd talk a little bit and hopefully he'd gamble. Steve Wynn might have done that when he owned the Golden Nugget down here. But up at his [current] place, on the Strip, he's dealing with a lot more zeros. I saw the personal touch as a huge opportunity, a way to do things that they can't do on the Strip. We used paper and pencil to keep track of how many people were coming into the casino. It was all pretty easy." Live performances and themed casual restaurants like the Heart Attack Grill are bringing in more foot traffic to downtown Vegas. Stevens has since refined his approach. 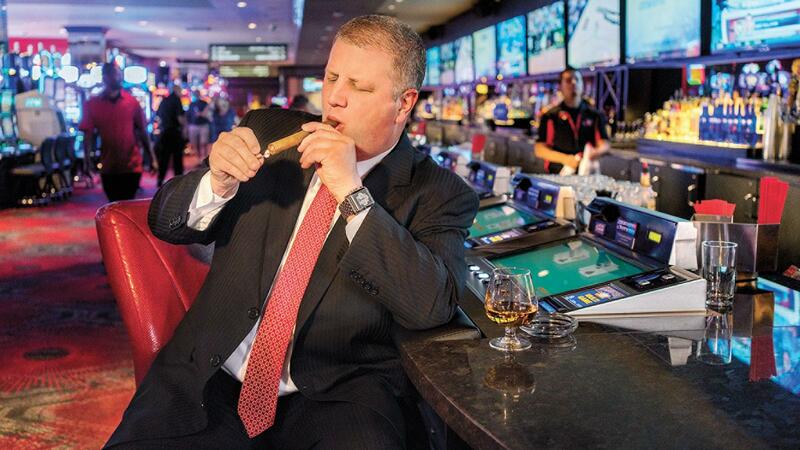 He lets the gamblers find him at the Long Bar—easy to spot, he's usually wearing a flashy sport jacket, having learned "subtlety doesn't pay in Las Vegas"—and they can play for $5,000 a hand if they feel like it. Still hungry for growth and not shy about publicity, Stevens recently purchased the old Vegas Club, a shuttered casino where business had tanked and the asbestos needed to be removed. It once stood as a downtown landmark and Stevens hopes to bring back its former glory and then some. It's been reported that he and his brother paid $40 million for the decrepit gambling den. He acknowledges that he did not need another casino. But he wasn't crazy about the people who were talking about buying the languishing property and turning it into an oversized pharmacy. "I have nothing against Walgreens and Rite Aid, but I don't think people want to come down here for a good time and see a place that makes them think about their high cholesterol and blood-pressure medicine," says Stevens. "They come here to see what they don't see in Mainstream USA." Doherty, however, believes that there was something more practical and less romantic at play. "I think Derek had strong feelings about package liquor being sold," says Doherty, referring to the fact that pharmacies in Vegas tend to have liquor licenses and undersell casino bars and booze retailers. Either way, Stevens sounds like he plans on doing something special with the old Las Vegas Club. He's gotten rid of the asbestos and is in the process of stress-testing for wind with the intention of adding height to the towers. But that's just the beginning. "I think downtown can now support a casino that has additional amenities," he says. "I'm thinking there could be a great pool, great spa, great restaurants, a really great sports betting experience." He ticks off the Golden Nugget, Four Queens and California Club as downtown properties that are all upgrading their accommodations. Then he adds, "Now is a time to provide more upscale rooms in this market." Assuming he doesn't mean that downtown—which remains a bit rough around the edges—could handle a Bellagio-style hotel, I ask if he's thinking of something along the lines of the Palms. Without hesitation, Stevens responds, "There is an opportunity to do something a little nicer than that." Derek Stevens is not the only one making a pitch for dominating the once toxic downtown Las Vegas. Also putting in money and buying up property is Tony Hsieh (pronounced shay). He made his fortune in tech and founded the online shoe retailer Zappos. Hsieh relocated his company to Las Vegas because he viewed it as the best city in America for round-the-clock customer service. Like Stevens, he also became enamored with downtown. Unlike Stevens, he has no interest in gambling. Instead, he's using an investment of some $350 million to back businesses that he hopes will build community and turn the beaten up neighborhood into something more akin to Austin's downtown. Hence, when he purchased the once treacherous Gold Spike, Hsieh put the property's gaming license into cold storage and outfitted the place with foosball and ping-pong tables. It looks like a student center rec room instead of the down-and-dirty joint that it had once been. There are those who view that as crazy. But Hsieh figures that Las Vegas has enough gambling. Under the auspices of the Downtown Project, he's backed a raft of businesses, like record and book stores; a fairly unique retail/recreation space called the Container Park (fronted by a giant statue of a praying mantis that shoots flames into the air); enough restaurants that downtown starts to feel like a dining destination; and a music festival called Life is Beautiful (since sold to Doherty's company). Hsieh is aiming to make a desirable neighborhood for locals that will attract talent to Zappos, which is now headquartered in what had once been Las Vegas's City Hall. What's strange is that if you walk along Fremont Street, Las Vegas Boulevard seems to be the DMZ. On one side of it is the Heart Attack Grill, where anybody over 350-pounds eats for free and the milkshakes get augmented with sticks of butter. Beyond that is the so-called Fremont Street Experience with live cover bands, street performers, vendors selling all manner of gewgaws and, yes, the casinos. Directly across from the Grill, on the other side of Las Vegas Boulevard, stands a funky but cool restaurant called Park on Fremont. It's a Doherty-owned neighborhood food and drink spot with a clientele of mostly youngish, more-or-less hip locals. The two crowds don't do a whole lot of mixing. But Hsieh doesn't seem to mind. "Derek and I are 74 percent simpatico," he says, downing his first of what will be six shots of the digestif Fernet over the course of our 30-minute interview. "I think he is here for the right reasons and we always look for reasons to work together." I mention the oddness of their two worlds abutting, yet remaining segregated. He corrects me, pointing out that there have been occasions when folks from the gambling world mingled with his crowd of happening locals. "When we threw Life Is Beautiful, Derek not only supported it but people went to the D for after parties." He gushes about the electronic dance music (EDM) concerts that Stevens hosted on a large parcel of property he owns near his casinos. After I confess that I thought he and Stevens were in a sort of tussle for the soul of downtown Las Vegas, one focusing on gambling and the other focusing on, well, shots of Fernet, Hsieh corrects my narrative. He tells me that he used to come to Vegas to play poker at the Bellagio and then he makes something abundantly clear: "I am not anti-gambling. I am anti Las Vegas being pigeonholed as one thing." Then the idiosyncratic billionaire, who established a trailer park so that he could live there in his Airstream, calls for another round of Fernet and adds, "I'm all about experiences. Anything that gives me a unique, memorable experience, I am interested in." With a bankroll of nearly half-a-billion dollars, he is on his way to accomplishing his goal. What it will look like in 10 years and whether or not his ventures will be profitable are anybody's guess. After downing the shot, he considers the two sides of Vegas Boulevard and says, "There are bright lights and fire in both directions." Las Vegas stole the heart of Derek Stevens long before it became an investment for him. He remembers his first trip there. The future hotelier was 19 years old and drove to Vegas from Los Angeles with a friend. "I had 40 bucks on me and he had 60," says Stevens, holding court in a booth at Andiamo steakhouse, sipping wine, twirling pasta, working his way through an entrée of Chilean sea bass. "We got ourselves a room at the Dunes and the first thing I played was Sigma Derby, the little horse racing game." He's referring to the electromagnetic race in which gamblers bet on which metallic nag will win. Stevens says that he wants to get a couple of them for his casinos, and I assume it's for old-time's sake and not because the house maintains a 10 to 20 percent edge on the wagering. "Then we won 40 bucks at roulette, paid for another night and fell in love with Vegas. We used the remaining $10 to buy a couple of $5 cigars." As his wealth grew so did his trips to Las Vegas. For pleasure and for conventions, he became a Sin City regular, staying at the old Aladdin for a while, then Hard Rock and later Mirage and Bellagio. "I thought it was the best," he enthuses in a tone that makes it easy to understand the success he's finding as a casino owner—he understands his customers because he's one of them. "Come to Vegas, get a room for a few nights, get fed, have a few drinks and gamble. This is the greatest city in America." He developed into an avid dice player and began looking at investment opportunities that could be more remunerative than laying down chips on the felt. Stevens made substantial stock investments in the slot manufacturer IGT and in the Rio All-Suite Las Vegas Hotel and Casino. He characterizes both businesses as having had "incredible runs." Rio, he adds, "went from one tower to three and I did really well when it sold [to Caesars Entertainment]. That got me a little curious about Vegas." Next came an equity investment in the floundering Riviera. "Then I started buying debt there and when the Riviera filed for bankruptcy, I converted the debt to equity and we ended up with 11 or 12 percent of the property," says Stevens. "We just sold the Riviera a little more than a year ago." Around 2007, Stevens decided to live the dream of most every recreational gambler: He wanted to enjoy the house advantage by owning a casino. Or at least a piece of one. He started looking around the state of Nevada for a suitable property, but it wasn't long before he set his sites on Vegas exclusively. That led to his getting involved in the Golden Gate partnership. He saw it as a way of figuring out whether or not he'd embrace the day-to-day reality of overseeing a casino. "I like running businesses," he says, explaining the rationale. "And I knew that if things didn't work out I could always pack up and return to Detroit." It took only six months for Stevens to confirm that gaming was for him. "By that point," he says, "people were calling me and wanting to check out the place. I liked the idea of people wanting to come over. I also like the idea of getting involved in a business that doesn't have a key or lock on the front door. That's literally a fact at the Golden Gate. When we did the renovation there in 2008, we needed to shut down temporarily and discovered that there are no locks. It hadn't been closed since the day that President Kennedy was shot." Stevens and his partner put in a couple of penthouse high-roller suites that would not look out of place on the Strip. The more standard suites—which really are long, narrow, loft-style rooms—look great, feel great, offer generous proportions and might be the biggest bargains in Vegas, usually selling for less than $100 per night. In fact, on the evening that we meet, there's an issue over which guests will get the high-roller suites and which will be in a standard suite. "We only have two of those penthouses and three guests want to check into them tonight," he says, smiling in a way that tells me it's a good problem to have. "The hotel sold one, and two hosts promised them to gamblers. Right now, I've got three employees in an office fighting it out." Derek Stevens stands in front of The D Las Vegas Casino. Previously Fitzgeralds, The D is emblematic of the efforts to revitalize and rebrand downtown Las Vegas. By the time he bought Fitzgeralds, Stevens felt like a practiced hand in Vegas. He chartered a 747 to fly in guests for opening parties on two consecutive weekends. He had already played an active role in cleaning up the area around his properties and installing offbeat amenities such as a zipline that, not coincidentally, seems to fly folks from one end of his mini empire to the other. He also developed a freewheeling management style where anything can happen on the spur of the moment. It's led to some odd promotions including a drawing for the casino owner's muscle cars. First to go was a Dodge Challenger Hellcat. Up for the taking at the moment is a new Shelby GT350 with a production of only 2,000. "I love giving away cars," he gushes. "The more slots you play, the better your odds of winning the car. I think it's kind of cool to give my car away to a player." Plus it's not lost on him that having the flashy ride parked right in front of his casino draws foot traffic. That might be a mildly surprising gimmick, but the real shocker came in 2012 when a blundered call by a fill-in NFL ref cost bettors a win. Stevens made himself look like the sportiest casino owner on earth. He paid off the winning wagers and refunded money to the losers. That decision was solidified within two days after the game had been played. "I remember exactly how much we refunded but I will never reveal the number," says Stevens after I express curiosity as to what it cost him to cancel his side of the bet. "That generated a lot of publicity." As did a situation that began in late 2014 when he made a $20,000 future bet that Michigan State would win the 2015 NCAA basketball championship. The bet came within a single game of paying off. It would have resulted in a $1 million windfall for Stevens. "It got pretty crazy," he says. "If I make another bet like that and wind up going far with it, I don't know that I will go public." Considering that Stevens has an unquenchable penchant for publicity and a knack for leveraging every situation, that seems likely to be a bigger longshot than any wager on the board. Michael Kaplan is a Cigar Aficionado contributing editor.